Comet Siding Spring appears to streak across the sky in this new infrared image from NASA's Wide-field Infrared Survey Explorer, or WISE. The comet, also known as C/2007 Q3, was discovered in 2007 by observers in Australia. A wispy comet, a bursting star-forming cloud, the Andromedagalaxy and a faraway cluster of hundreds of galaxies are just a few of thecosmic sights seen in the first processed images from a new NASA all-skysurvey. NASA's new Wide-field Infrared Survey Explorer, or WISE,mission began scanning the entire sky in infraredlight on Jan. 14. Since then, the space telescope has beamed back more thana 250,000 raw, infrared images. Tucked away in that bunch were the four diversespace objects that give a taste of the survey telescope?s capabilities. "WISE has worked superbly," said Ed Weiler,associate administrator for science missions at NASA headquarters in Washington,D.C. "These first images are proving the spacecraft's secondary mission ofhelping to track asteroids, comets and other stellar objects will be just as criticallyimportant as its primary mission of surveying the entire sky in infrared." One image shows a comet called Siding Spring. As the cometzooms towards the sun, it sheds dust that glows in infrared light visible toWISE. 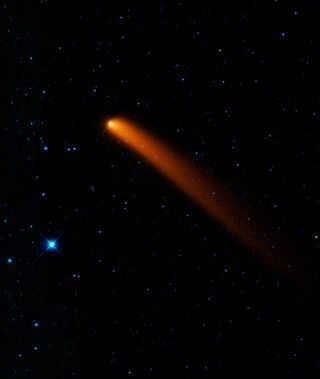 The comet's tail, which stretches about 10 million miles (16million km), looks like a streak of red paint. A bright star appears below itin blue in the WISE image. During its survey, the WISE mission is expected to find dozensof comets, including some that ride along in orbits that take them somewhatclose to Earth's path around the sun. It found its firstnew comet on Jan. 22. Scientists hope WISE will help unravel clues lockedinside comets about how our solar system came to be. Another new image shows a bright and choppy star-formingregion called NGC 3603, which sits 20,000 light-years away in the Carina spiralarm of our Milky Way galaxy. This star-forming factory is churning out batches of newstars, some of which are monstrously massive and hotter than the sun. The hotstars warm the surrounding dust clouds, causing them to glow at infraredwavelengths. WISE will see hundreds of similar star-making regions in ourgalaxy, helping astronomers piece together a picture of how stars are born. Theobservations also provide an important link to understanding violent episodesof star formation in distant galaxies. Because NGC 3603 is much closer,astronomers use it as a lab to probe the same type of action that is takingplace billions of light-years away. The third new image peers farther out from our Milky Waygalaxy to our nearest large neighbor, the Andromeda spiral galaxy. Andromeda isa bit bigger than the Milky Way and about 2.5 million light-years away. The new picture highlights WISE's wide field of view ? itcovers an area equivalent to more than 100 full moons and even shows other smallergalaxies near Andromeda, all belonging to our local group of more than about 50galaxies. WISE will capture the entire local group. The fourth WISE picture provides an even more distant view.It shows a region of hundreds of galaxies all bound together into one family. Called the Fornax cluster, these galaxies are 60 millionlight-years from Earth. The mission's infrared views reveal both stagnant andactive galaxies, providing a census of data on an entire galactic community. "All these pictures tell a story about our dustyorigins and destiny," said Peter Eisenhardt, the WISE project scientist atNASA's Jet Propulsion Laboratory in Pasadena, Calif. "WISE sees dustycomets and rocky asteroids tracing the formation and evolution of our solarsystem. We can map thousands of forming and dying solar systems across ourentire galaxy. We can see patterns of star formation across other galaxies, andwaves of star-bursting galaxies in clusters millions of light years away." Other WISE mission targets include asteroids within oursolar system and cool failed stars known as browndwarfs. WISE discovered its firstnear-Earth asteroid on Jan. 12. By October 2010, WISE will have scanned the skyone-and-a-half times, at which point, the frozen coolant needed to chill itsinstruments will run out.